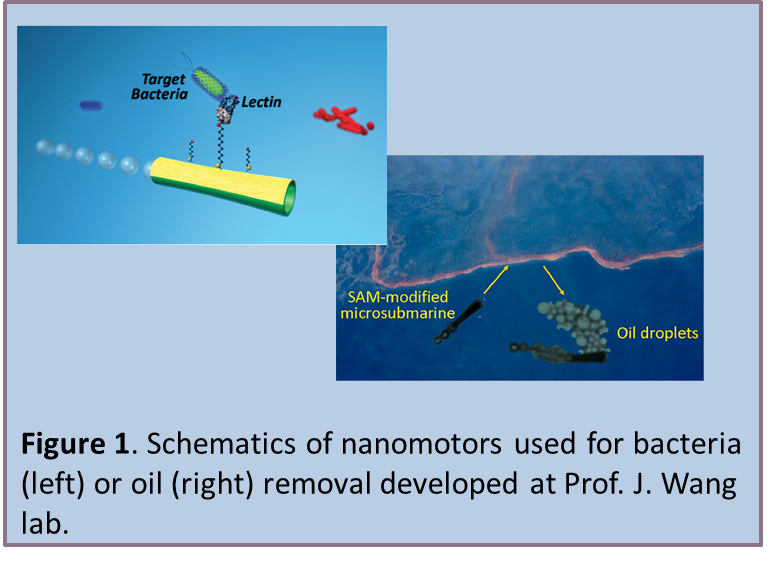 The motion and power of self-propelled synthetic and natural nano/microscale motors have been exploited recently by Prof. Joseph Wang’s group in USA (http://ne.ucsd.edu/~joewang/) as an attractive route for transporting target biomaterials. The limitations of biological motors for engineered microchip environments have motivated the use of synthetic nanomotors for diverse biomedical and bioanalytical applications. Particularly attractive for such applications are bubble-propelled microtube engines owing to their efficient movement in fuel-enhanced biological fluids and their large towing forces. Functionalizing photolitographically prepared rolled-up microtube engines with oligonucleotide or antibody receptors has recently been shown to be extremely effective for capturing and isolating target biomolecules and cells from biological samples. Yet, as mentioned by Dr. Wang “the preparation of these rolled-up microengines is complex and costly, requiring the use of clean-room facilities”. The fabrication of the nano/microengines involving template based electrodeposition of polymers and metals is opening the way to the development of various nano/micromotors with interest for various field. The employment of these devices in biosensing technology seems to be one of the main focuses of these very attractive devices. Self-propelled antibody-functionalized synthetic catalytic microengines for capturing and transporting target proteins between the different reservoirs of a lab-on-a-chip (LOC) device also have been demonstrated. A catalytic polymer/Ni/Pt microtube engine, containing carboxy moieties on its mixed poly(3,4-ethylenedioxythiophene) (PEDOT)/COOH-PEDOT polymeric outermost layer, is functionalized with the antibody receptor to selectively recognize and capture the target protein. 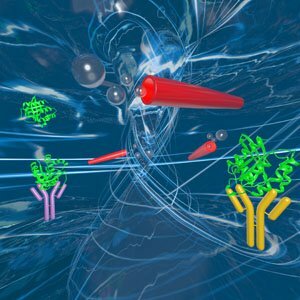 The new motor-based microchip immunoassay operations are carried out without any bulk fluid flow, replacing the common washing steps in antibody-based protein bioassays with the active transport of the captured protein throughout the different reservoirs, where each step of the immunoassay takes place. The development of nano/micromotors in collaboration with Prof. Joseph Wang groups is now extended toward new biosensing applications where these devices are expected to bring significant improvement in biosensing technology , for example in miniaturized immunoassays. Persistent organic pollutants (POPs) are one of the most troublesome hazardous compounds wide-spread in the environment as residual products of modern industrial processes, remaining in the environment for long time. Micro/nanomotors have shown to offer unprecedented potential for a broad range of (bio)chemical applications, including environmental remediation. We reported an efficient strategy for remediation of POPs based on their dynamic adsorption at the surface of reduced graphene oxide (rGO)-coated silica (SiO2)-Pt Janus magnetic micromotors for their proper final disposition . In the publication we characterized the micromotors in terms of materials and motion and showed the adsorption of POPs was efficiently taking place at the micromotors surface while motors were moving in a contaminated solution. We demonstrated the micromotor-assisted remediation concept by the removal of polybrominated diphenyl ethers (PBDEs) and 5-chloro-2-(2,4-dichlorophenoxy) phenol (triclosan) as model of POPs. Adsorbent properties of rGO-coated micromotors were superior respect to the concomitant GO-coated micromotors, static rGO-coated particles and dynamic silica micromotors homologous. The extent of decontamination was increasing as higher was the number of micromotors, which magnetic properties were used for their collection from environmental samples. Adsorption properties were kept for 4 cycles of micromotors reuse. The new rGO-coated SiO2 functional material-based micromotors showed outstanding capabilities for removal of POPs and their further disposition, opening up new possibilities for the efficient environmental remediation of these hazardous compounds. We also explore a simple way to architect a facile micromotor . Our method is more cost-efﬁcient and less laborious tubular machines that overcome the limitations of microelec-tronic technology related to the requirements of a clean room facility and trained personal. 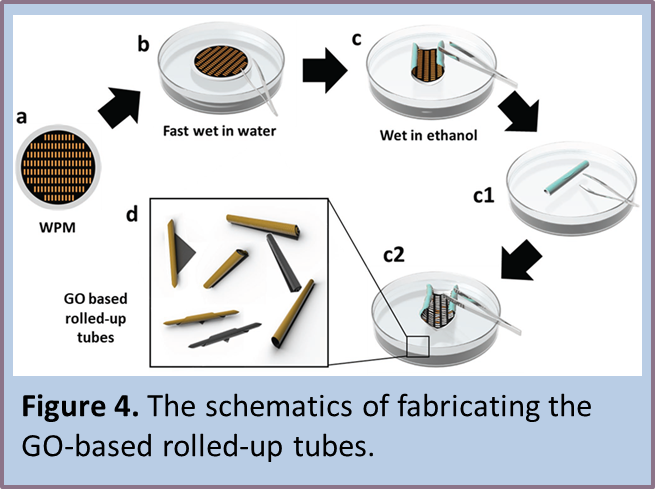 In our study, the graphene oxide rolled-up tube production process using wax-printed membranes are produced for the fabrication of on-demand engineered micro-motors at different levels of oxidation, thickness, and lateral dimensions (Figure 4). Besides, the resultant graphene oxide rolled-up tubes can show magnetic and catalytic movement within the addition of magnetic nanoparticles or sputtered platinum in the surface of graphene-oxide-modiﬁed wax-printed membranes prior to the scrolling process. Finally, as a proof of concept, the as-prepared catalytic graphene oxide rolled-up micromotors are successfully exploited for oil removal from water. We expect that this micromotor production technology can offer a myriad of hybrid devices and applications. 1) Susana Campuzano, Jahir Orozco, Daniel Kagan, Maria Guix, Wei Gao, Sirilak Sattayasamitsathit, Jonathan C. Claussen, Arben Merkoci and Joseph Wang, “Bacterial Isolation by Lectin-Modified Microengines”. Nano Letters, 2012, 12 (1), pp 396–401. 2) Maria Guix, Jahir Orozco, Miguel García, Wei Gao, Sirilak Sattayasamitsathit, Arben Merkoçi, Alberto Escarpa, Joseph Wang, “Superhydrophobic Alkanethiol-Coated Microsubmarines for Efective Removal of Oil”, ACS Nano, 2012, 6 (5), pp 4445–4451. 3) Miguel García, Jahir Orozco, Maria Guix, Wei Gao, Sirilak Sattayasamitsathit, Alberto Escarpa, Arben Merkoçi, Joseph Wang, “Micromotor-Based Lab-on-Chip Immunoassays”, Nanoscale, 2013, 5, 1325-1331. 4) Maria Guix, Carmen C. Mayorga-Martinez and Arben Merkoçi, “Nano/Micromotors in (Bio)chemical Science Applications“, Chemical Review, 2014, 114 (12), pp 6285–6322. 5) Eden Morales-Narváez, Maria Guix, Mariana Medina-Sánchez, Carmen C. Mayorga-Martinez, Arben Merkoçi, “Micromotor Enhanced Microarray Technology for Protein Detection“, Small, 2014, 10, (13), 2542–2548. 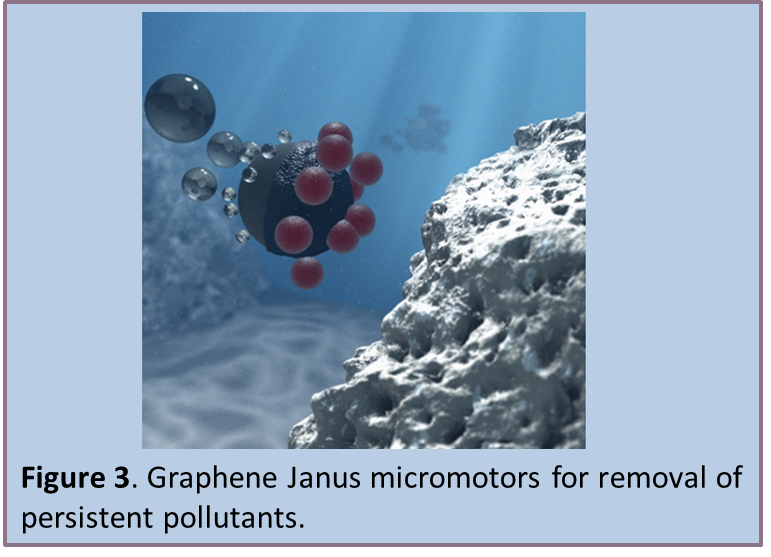 6) Jahir Orozco, Luiza A. Mercante, Roberto Pol, and Arben Merkoçia, Graphene-based Janus micromotors for the dynamic removal of pollutants, Journal of Materials Chemistry A 4 (9), 3371-3378. 7) Luis Baptista Pires, Jahir Orozco, Pablo Guardia, Arben Merkoçi.Architecting Graphene Oxide Rolled-Up Micromotors: A Simple Paper-Based Manufacturing Technology, Small 2018, 14, 1702746. 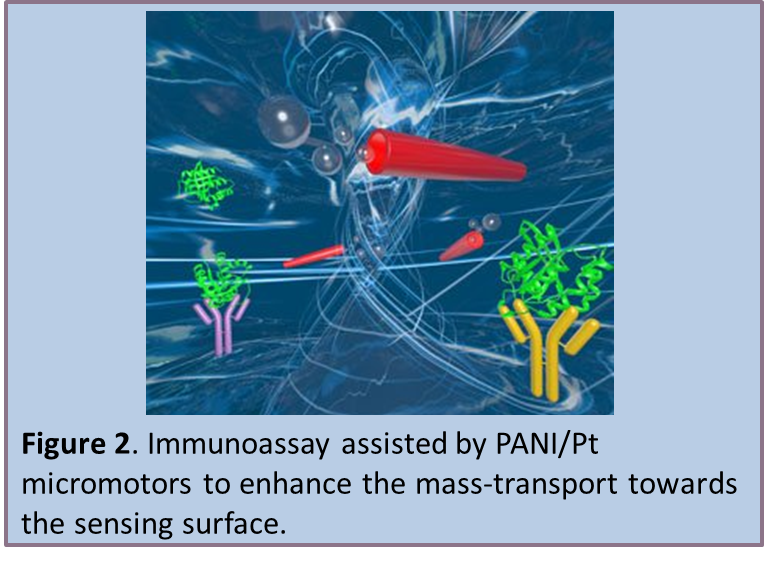 8) Andrzej Chałupniak, Eden Morales-Narváez, Arben Merkoçi, “Micro and nanomotors in diagnostics“, Advanced Drug Delivery Reviews, Volume 95, 1 December 2015, Pages 104–116.